Serta is the #1 mattress manufacturer in the United States and a leading brand across the globe. Every Serta mattress is designed to provide exceptional comfort. Our product portfolio spans every price point and mattress construction, so that everyone can find the sleep comfort they deserve. 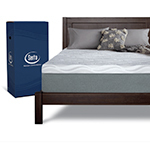 Serta iComfort Memory Foam mattresses combine advanced gel memory foam material with an all-foam support system. These mattresses are an ideal solution for those who want the contouring feel of an all-foam mattress with the latest advancements in memory foam technology. Serta iComfort Hybrid mattress models combine advanced gel memory foam with our most advanced individually wrapped steel coil innerspring systems. These mattresses are an ideal solution for those who are interested in the benefits of gel memory foam, but prefer the support of an advanced innerspring. Inspired by the same exclusive luxury reserved for Bellagio hotel mattresses. Comfort you expect from Serta. Packaged to-go. YES, please send me more information about Serta Mattresses!